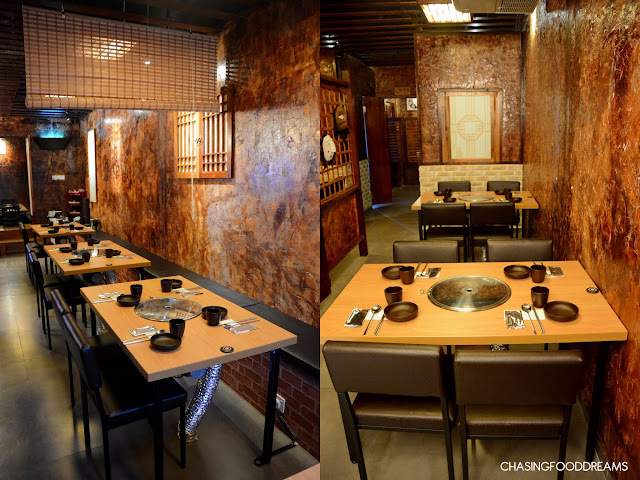 Korean cuisine has taken our dining scene by storm. Many have sprouted all over our nation and now Korean cuisine is gearing up to be as popular as Japanese cuisine. The Koreans are indeed famous for their Kimchi. You’ll either love it or hate it. Glad to say, most Malaysians do love it as well as their other signatures like Korean BBQ and stews. Even my family admits to indulging Korean cuisine at least 3 times a month. One of the latest Korean restaurant in Petaling Jaya is Mido, located at the bustling SS2 area. Mido is the brilliant brainchild of young Korean business owner Mr. Joseph Lee and his partners. After arriving in Malaysia, Joseph has decided to pursue his F&B interest to add on to his other businesses. The young entrepreneur opened Mido in July this year, serving up lots of Korean classics of BBQ, stews and even Korean Fried Chicken. The restaurant’s front is designed to look just a like a Korean house with big heavy wooden doors. There are two windows on each side and unlike most restaurants, one cannot see the dining unless the windows are open. Walking into Mido, diners are immediately transported to warm and vibrant interior filled with lots of wood. We were told that Mido’s interior is actually designed and finished by Joseph and his team as well. 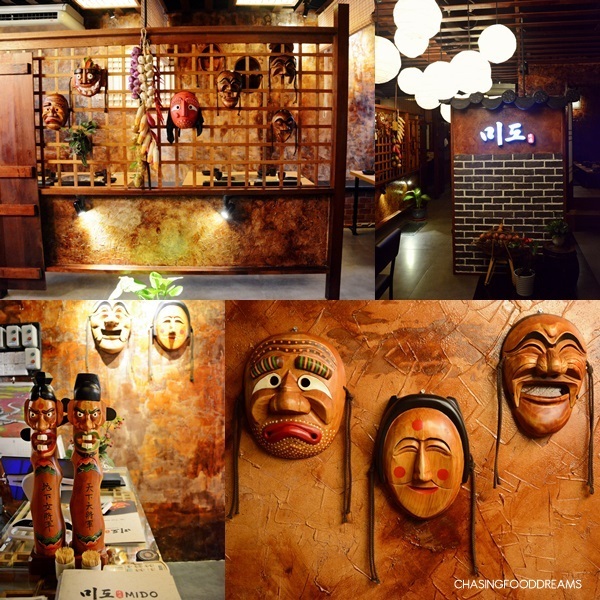 Vibrant warm walls, sectioned panels giving diners privacy, Korean Hahoe masks, paper lanterns and more earthy elements summed up the gorgeous interior. Mido also has private rooms with seating on the floor. Dining at Mido certainly feels like I was transported elsewhere, without any trace of the bustling SS2 traffic outside since the whole restaurant is closed up. Another plus point for Mido, they use the underground ventilation system which is better as it prevents the usual BBQ smoke from seeping into our clothes and hair. Let’s eat! Korean meal is never without Banchan. These side dishes are always such a treat and most restaurants allow refills in moderate quantity. Mido serves less Banchan than other restaurants I know but they have more types of sauces and plenty of fresh lettuce, seasoned lettuce together with the fresh cut garlic and green chilies. Their Kimchi is really yummy and we kept having refills of this gladly. Mido serves four sauces – Sesame Oil with Salt, Ssamjang, Basil and Peanut sauce. Though classics are good, I really enjoyed the Basil and Peanut sauces as they really perked up the BBQ meats in flavours. Mido’s menu has limited options of the various cuts of meat but I personally think the ones they have are sufficient for me. 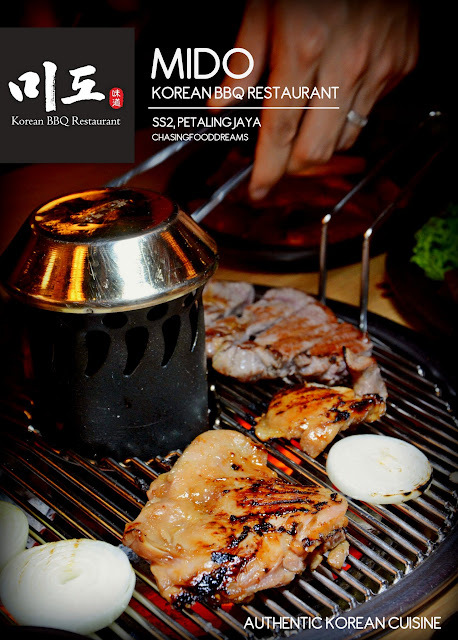 The Korean BBQ meats available are Chicken BBQ (RM28 for 200gm), Pork Collar (RM30 for 200gm) Marinated Pork (RM33 for 200gm), Chili Paste Pork (RM33 for 200gm) and Marinated Beef Rib (RM65 for 280gm). The meats here are cut thicker than most other places I have had and I certainly didn’t mind this at all. The wait staff helps to grill the meat for you so you just need to enjoy them. Once grilled under the hot coals, these meat are deliciously tasty, moist and so irresistible with the sauces and lettuce. 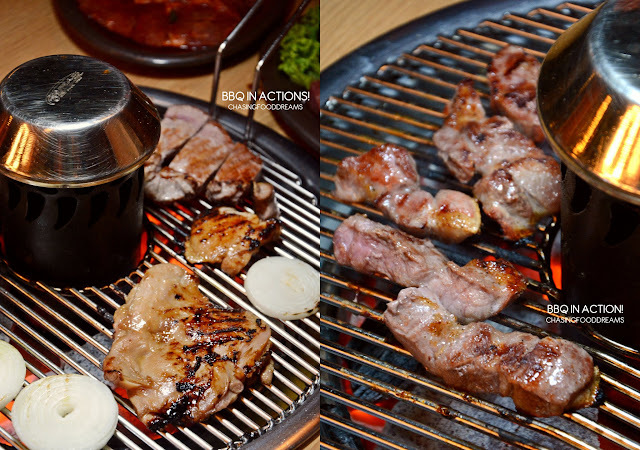 I was particularly fond of the Pork Collar and Marinated Pork because of their tasty flavours and tender texture. While man cannot live alone on BBQ (or maybe they could! ), we also had other goodies. A bowl of Pumpkin Soup came complimentary and this was a good bowl to settle our tummies. It had a good balance of sweetness and savory notes. Besides the pumpkin soup, we had an order of Doenjang Soup (RM22). A Korean favorite, this bean paste soup has seafood and fresh tofu. It is quite nutty and pungent with a saltish edge but it goes really well with rice. Talk about having a secret weapon at Mido, they serve this wicked dish of Spicy Pork Skin (RM20). Pork skin has loads of collagen so enjoying these are bound to give one some lovely doses of beauty benefits. The gelatinous pork skin is cooked with a good hit of heat and is served with bean powder on the side. We attached this with so much gusto and had a reorder of the dish! Ok so fried chicken wings are not seen at Korean BBQ places but Korean Fried Chicken are getting quite the attention these days. Mido has two styles of one non spicy and the other spicy. The Korean Fried Chicken Wings (RM25) were decent with a nice balance of savory sweetness while the Spicy Korean Fried Chicken Wings (RM25) had a spicy sweet heavy note. It was unanimous that we all enjoyed the Tofu Kimchi Casserole (RM45). A big iron pot filled with lots of ingredients such as kimchi, vegetables, mushrooms, tofu, Korean vermicelli, rice cakes, sausages and more sat in a pool of kimchi based soup. As the stew boils, the soup intensify in flavours and the ingredient are gently cook to absorb the pungent and spicy kimchi flavours. It’s very comforting in many ways or maybe I just happen to be a big kimchi lover… yum! We also had their Bulgogi Casserole (RM48). Bulgogi is a classic favorite dish in Korea. Here the beef is marinated in the classic sweet flavours of Bulgogi and is accompanied by lots of vegetables, mushrooms and Korean vermicelli noodles in a beefy sweet broth. It was slightly a tad too sweet for my preference but that’s how Bulgogi taste and so there’s really nothing to fault here but my own taste bud. Others didn’t seemed to mind and enjoy the beefy sweet stew happily. Don’t forget to order Makkoli (RM28), a Korean rice wine that went so well with the BBQ meats, Spicy Pork Skin and Korean Fried Chicken Wings. I love how it was served in a big clay bowl to be ladled on smaller bowls to be sipped slowly.